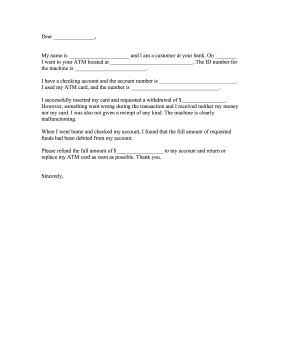 Directed at a bank for faulty equipment, this equipment letter cites a malfunctioning ATM and request a refund. My name is ______________________ and I am a customer at your bank. On ________ I went to your ATM located at ______________________________. The ID number for the machine is __________________________. I have a checking account and the account number is ____________________________. I used my ATM card, and the number is ________________________________. I successfully inserted my card and requested a withdrawal of $________________. However, something went wrong during the transaction and I received neither my money nor my card. I was also not given a receipt of any kind. The machine is clearly malfunctioning. When I went home and checked my account, I found that the full amount of requested funds had been debited from my account. Please refund the full amount of $_________________ to my account and return or replace my ATM card as soon as possible. Thank you.